Rather than adopt the conventional self-effacement that defined female poets of the time, l’Aubespine’s speakers are sexual, dominant, and defiant; and her subjects are women who are able to manipulate, rebuke, and even humiliate men. Unavailable in English until now and only recently identified from scattered and sometimes misattributed sources, l’Aubespine’s poems and literary works are presented here in Anna Klosowska’s vibrant translation. This collection, which features one of the first French lesbian sonnets as well as reproductions of l’Aubespine’s poetic translations of Ovid and Ariosto, will be heralded by students and scholars in literature, history, and women’s studies as an important addition to the Renaissance canon. "This new edition is the only one gathering the poetess’ complete poetic works. 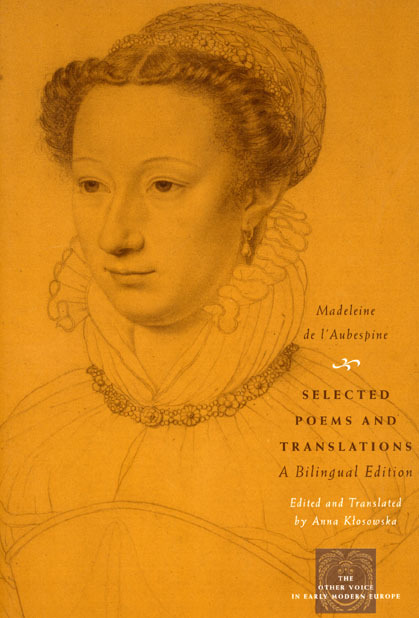 It is also the first English translation. . . . [It] is very readable and will help this largely unknown female author reclaim her place next to the most famous poets of Renaissance France."